Two weeks after ostensibly committing to running a clean campaign, District 1C Republican candidate Nicole Alt-Myers reversed course and launched a blistering attack against her primary opponent, incumbent state Del. Mike McKay (R-Cumberland), in a Saturday Facebook post. 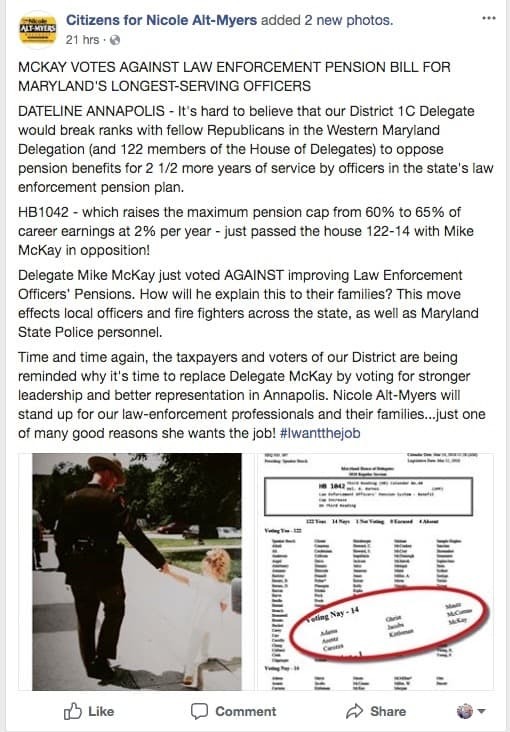 Alt-Myers, a former Cumberland City Councilwoman, yesterday took to her public Facebook campaign page, Citizens for Nicole Alt-Myers, to criticize McKay for voting against HB 1042, the Law Enforcement Officers’ Pension System – Benefit Cap Increase. If signed by the governor, the legislation will raise the maximum pension cap from 60% to 65% of career earnings at 2% per year, according to Alt-Myers. 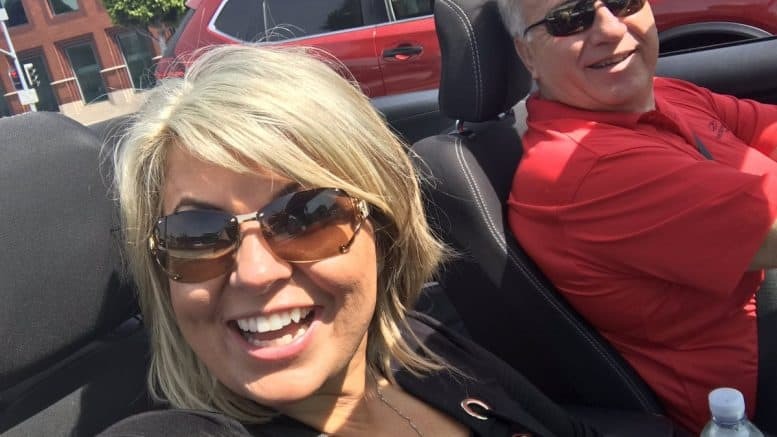 Alt-Myers’ social media harangue of McKay appears to blatantly mischaracterize McKay’s recent vote. The bill puts the state in charge of county decisions, and that’s why I voted against it. I even offered an amendment that would have exempted counties, like Allegany County, who are doing a great job administering this program on their own. That amendment failed. I have consistently voted against any bill that threatens local autonomy, and that’s what I did here. I’ve been a friend of law enforcement in Annapolis, and any move to put the state in charge of local decisions would negatively affect the benefits we provide to our officers. A campaign aide for McKay’s re-election campaign provided A Miner Detail an additional statement indirectly addressing Alt-Myers play at dirty politics. 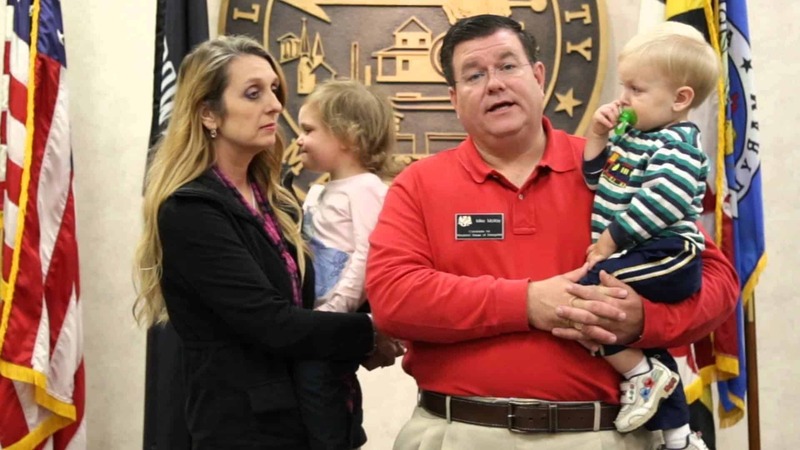 A District 1C resident challenged Alt-Myers’ Facebook attack on McKay; however, the commentator’s post was later deleted. This is not the first time Alt-Myers has deleted dissenting opinion from her Facebook page. Alt-Myers is also facing off against Hancock attorney Jordan Lysczek in the Republican primary. No Democrat filed to run in District 1C.